In my previous posts, I theorized that Microsoft's strategy to boost developer interest through sales of Windows 8 PCs was flawed and was unlikely to create a strong app ecosystem. With this in mind, let's take a look at the most recent data for the Windows 8 store and gauge Microsoft's progress. 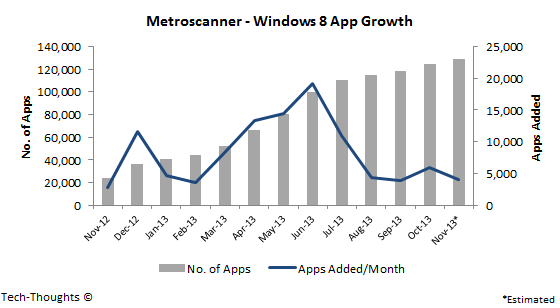 The chart above shows Metroscanner's 12 month app statistics for the Windows 8 store. With nearly 20,000 additions, app submissions peaked in June, but after that app additions fell off a cliff. Monthly app additions crashed to 10,000 in July and have hovered between 4000-6000 since then. Paid Microsoft promotions were the most likely cause of the spike in June, but as I expected, that did not generate sustainable developer interest. Why didn't it? While the PC market is shrinking, the overall volumes are still sizeable compared to the user base for tablets. So shouldn't sales of Windows 8/8.1-based PCs be driving volume and, therefore, developer interest? Why aren't developers taking this user base into account? The answer is simple: Most Windows 8 devices are bought as PCs, not tablets. Slapping a tablet interface (or a touchscreen) onto a PC doesn't address this problem. Most users would spend very limited time in the Metro interface and switch back to desktop for the jobs they needed the PC to accomplish. As a result, the Windows 8 store has been relegated to the background and developers are losing interest in the platform.